Decorating a beach home living room is still an easy job. However, when it comes to decorating the bedroom, people are often puzzled what to do. It is quite obvious as you can’t follow a white single colored theme in your bedroom. Therefore, we are bringing some beautiful beach home bedroom design ideas for you. 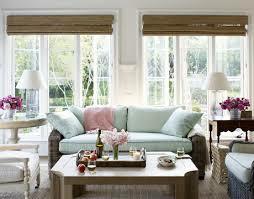 You would be finding them to be more charming, graceful and quite energetic as compared to the calmer living room. This is your own personal space and you can be more adventurous here. Nonetheless, we are bringing a host of design ideas that would definitely appeal to your tastes. Have a look! The green breezy bedroom- green, rather pale emerald green is one of the least talked about colors when it comes to beach home decoration. However, it is one of the most effective and calming too. No matter how much we talk about it (or how much we don’t), there are hundreds of beach houses out there that depend on green, instead of blue, for a calming effect. This theme is based on the same principle. Chose a shade of white that is lightly painted with green. Don’t go for a typical green colors, keep the walls as white as possible. There should only be a hint of green here. Now, buy a beautiful metal bed. We are using some nautical elements here so a rounded edge metal bed in deep emerald green would work like magic. Use white bed sheets and duvet covers. Now, team them up with large emerald green cushions. Finally, add some white small cushions that come with a huge starfish print. Any other furniture used in this space would also be green with white accessories or vice versa. Perfect for the calmer personalities. 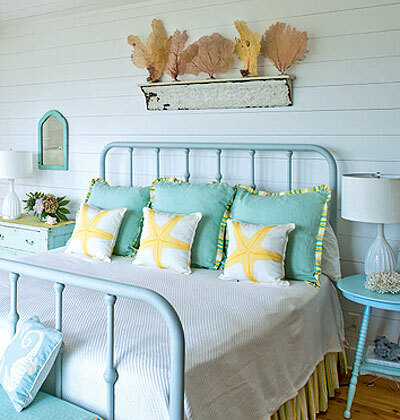 Beach bunk room- who said it was all about white or bright colors? You can go in the opposite direction and depend solely on the earthen and warm tones of wood to get a beach bunk room. The idea is to paint the walls like wooden pallets and leave the accented edges to white. This should not be an egg white shade. Chose a creamier shade of white so that it doesn’t look out of place with the brownish interiors. Finally, get a bunk bed or an ottoman style bed that comes in a very dark and deep shade of chocolate brown. Use a cream white bed sheet and light brown, dark brown accessories in the room. You can also throw in some orange in this décor as the warm honey shade of the walls would suit with a dull orange quilt or comforter really well. White but blue bedroom- have you ever thought about a total whitewash of the room that comes with a very pale shade of blue? This is one of the easiest design ideas to follow. You just need white chairs, a white bed and white cabinets. Paint them all in a very light shade of indigo blue and team them up with off white walls in order to get the most oceanic effect in your room. The people who have just bought a beach cottage must be wondering about the kind of décor ideas that they must adopt in order to decorate their space. This is a very unique kind of space and demands even more unique furniture and décor ideas. Therefore, you cannot chose your décor and furniture in a hurry. If you want to get the best, then we suggest that you visit one of the good Nashville TN furniture stores, like the Atlantic Bedding and Furniture Store. Here, you would be finding very genuine coastal or beach style furniture. However, to buy the most authentic style of furniture for your beach cottage, you also need to understand about the different coastal style furniture design ideas prevalent these days. It would help you in making more informed decision. Please check out www.abfnashville.com for more information. American coastal style- this is one of the most casual and comfortable styles of beach cottage designs that you can find in the Nashville TN furniture stores. The basic theme is comfort and relaxation and you would find it in every piece that has been constructed with this design. In fact, American coastal is one of the top home design ideas in the U.S. It has many branches as well. The Contemporary American Coastal and the Cottage American Coastal are two of the most beloved sub-genres of this style. In this kind of décor, the focus is on getting as much natural light as possible and then mixing it up with warmer shades of white, blue, green and other oceanic colors. People also use very soft furnishings, mismatched nautical décor and reflective surfaces here. Tropical island coastal style- this style is inspired from Hawaiian and Polynesian living. It also incorporates the themes and ideas from many other major islands of the pacific. In this style, you would find a lot of alternative furniture material like tiki and bamboo. The patterns are very bright and tropical and there is absolutely no scope for dullness. Teak is used a lot and people also prefer buying native décor items from the Nashville TN furniture stores. Mediterranean coastal style- this kind of style is inspired from Spain, Italy and mostly Greece. The style takes you away from the native pacific island cultures and brings more art and sophistication to your house décor. Usage of heavy woods, metal, black iron, carvings, detailed work and sunbaked colors along with terra cotta is very common.